Appleton Estate is planning to celebrate the centenary of Jamaica’s independence in 2062 with a special rum bottling being laid down next week. Nine ex-Jack Daniel’s casks will each be filled with 200 litres of new make Appleton Estate rum in anticipation of the historical event. 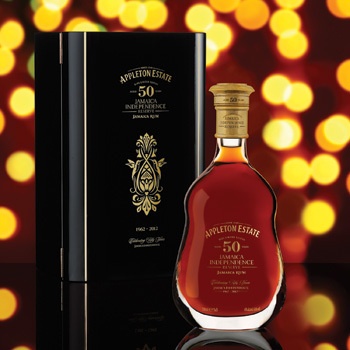 But in what master blender Joy Spence is calling a first for the spirits industry, each cask will also contain a full 750ml bottle of Appleton Estate 50 Year Old Jamaica Independence Reserve, released earlier this year to celebrate 50 years of the Caribbean country’s independence. It means that while the blend will carry an age statement of 50 years, it will in fact contain rum that has been aged for 100 years. Furthermore, Appleton Estate is inviting Jamaica’s nine current and ex-Prime Ministers, as well as representatives for those deceased, to each fill a cask adorned with a brass plaque bearing their name. As such, the rum producer will name the expression Appleton Estate Prime Ministers Reserve. “This is the first time a brand has poured an extra-aged spirit into a new make,” Spence told The Spirits Business. “I don’t think anyone else anywhere has ever done that. Spence is currently training protégé David Morrison to succeed her as master blender upon her retirement. She added that while the casks containing the 50 Year Old Jamaica Independence Reserve were chained to the floor to prevent theft, the Prime Ministers Reserve would be hidden in a special location and ‘indiscernible’ from other barrels in the warehouse. Meanwhile, its 50 Year Old Jamaican Independence Reserve is now available to buy in the UK, priced at £3,500 per 750ml crystal bottle. Always a step ahead of everybody else as usual …… I hope that i live until 2062 so i can taste this rum..